Hope everyone is have a great Mother’s Day weekend! 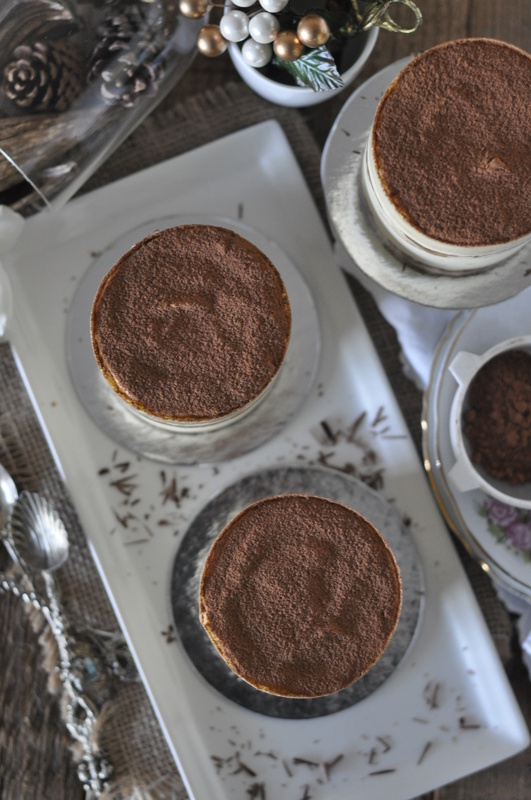 We celebrated with our moms yesterday and today I am making up for a late post on these wonderful individual tiramisu cakes I made about two weeks ago. 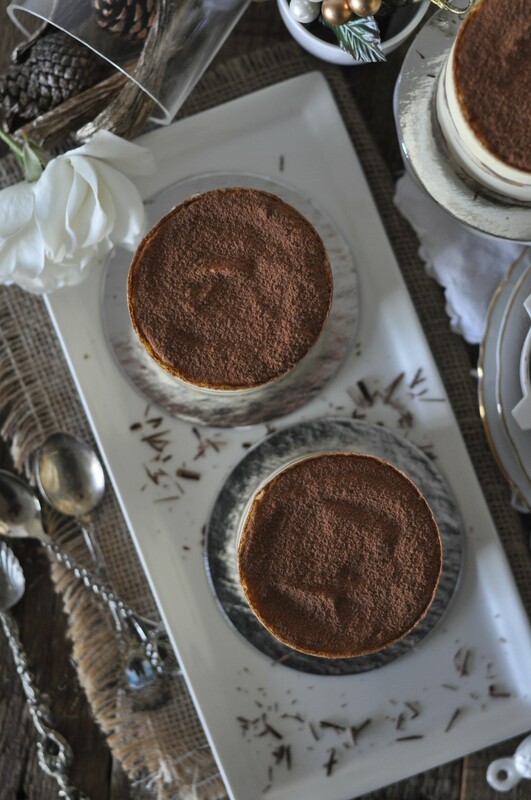 Tiramisu has been on my to-bake list for some time now and I’m glad I got around to them. I don’t order tiramisu for dessert at restaurants or buy them often, but when I do have the opportunity to eat them, I am reminded of how much I actually enjoy them. The combination of the rum-coffee soaked ladyfingers and the light Mascarpone filling makes it a delectable treat. 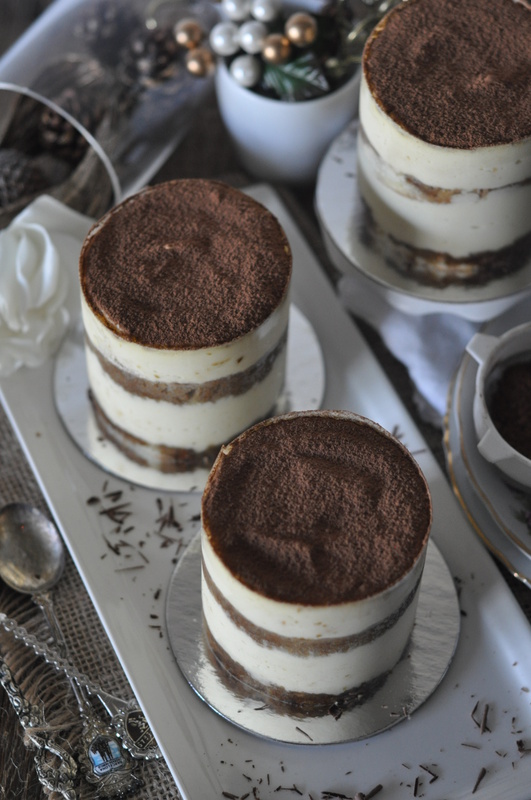 I’m a big fan of coffee flavored desserts, so it also explains why I like tiramisu. I didn’t look too hard to find lady fingers in the stores. I only checked Trader Joe’s and was told ladyfingers are a seasonal item, around Thanksgiving and Christmas. People did tell me that Whole Foods might have them, but I didn’t bother checking and decided to make them instead. The recipe I used yielded softer ladyfingers, almost like a sponge cake. I found a Mascarpone filling recipe from Pretty.Simple.Sweet blog, which called for cooked egg yolks. Most recipes use raw egg yolks, but I preferred to use a recipe with cooked egg yolks. Y= Twenty-nine 4-inch ladyfingers; this is enough for four 4-inch round individual tiramisu cakes. In a mixer bowl with a whisk attachment, beat egg whites until slightly foamy. Add powdered sugar and continue to whisk until meringue reaches stiff peaks. In a separate bowl, combine the egg yolks and vanilla. Carefully fold the egg yolk mixture into the meringue using a spatula. Add the flour into the mixture in 3 additions, folding after each addition. Line sheet pans with parchment paper. 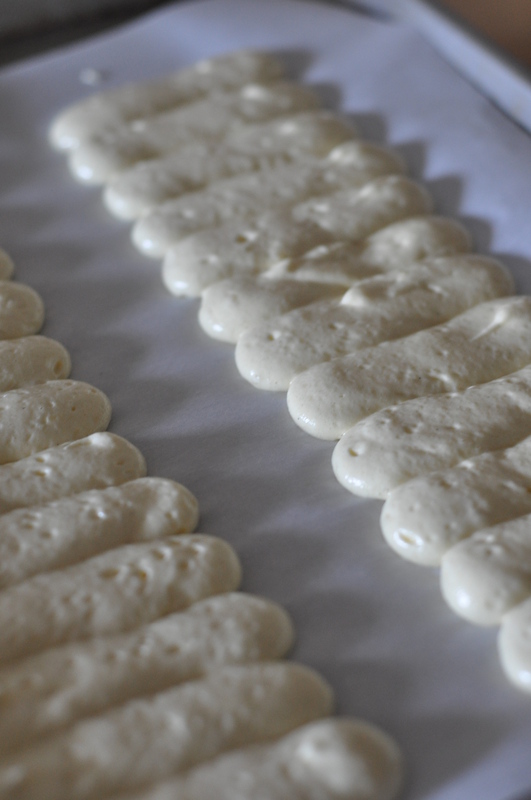 Lightly coat parchment paper with non-stick spray. Using a round Ateco 805 tip, pipe 4 inch ladyfingers so that each ladyfinger touches the adjacent ladyfinger. Make 2 strips of batter along the length of the sheet pan. Optional: lightly dust piped batter with powdered sugar. Bake at 350F 10-13 minutes, or until ladyfingers spring back from touch. Y= this is more than enough to soak the ladyfingers. You can reduce the recipe in half. Combine the hot water with the instant coffee, sugar and dark rum. Stir to combine and allow the mixture to cool. Combine egg yolks, sugar and dark rum in a heat-proof bowl. Place bowl over a pot of water, simmering on low heat. Cook the mixture while constantly whisking until it becomes thick and foamy. Remove from heat and allow the egg mixture to cool. In a mixer bowl, whisk the heavy cream until stiff peaks. Add the room temperature Mascarpone cheese to the cooled yolk mixture. Gently whisk to combine. Fold the whipped cream into the yolk-Mascarpone mixture. Continue to fold until mixture is smooth in consistency. Line cake rings with acetate strips. Line the bottom of the cake ring with lady fingers. You will need to trim off any excess to fit the round bottom of the rings. Since the ladyfingers are soft, I used a pastry brush to soak them with the coffee-rum syrup. Pipe some of the Mascarpone filling over the ladyfingers. (I prefer to pipe the filling to avoid major air bubbles; otherwise you can spoon the filling in). Repeat with another layer of ladyfingers, coffee syrup and filling. Smooth out the top layer of the Mascarpone filling. 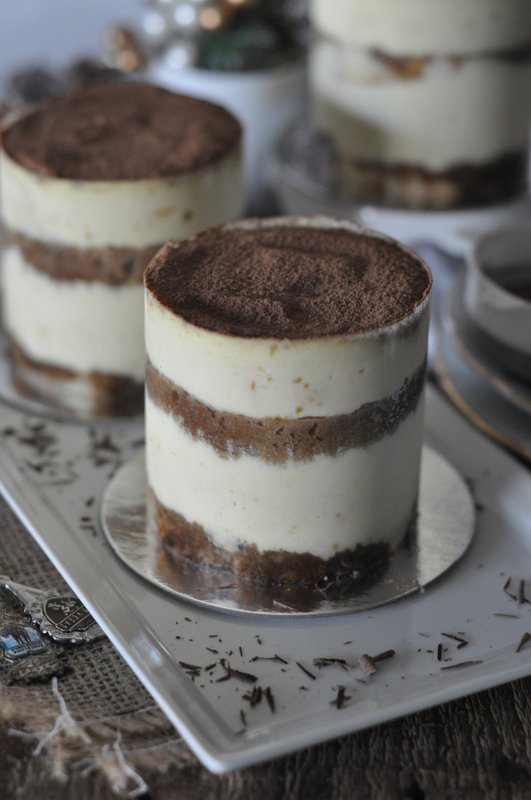 Allow the tiramisu to set in the refrigerator overnight before unmolding. Carefully unmold on the next day. Dust with cocoa powder and serve cold.